I love a good purple polish and Berry Delicious from Miss Ashleigh does not disappoint! In this review, I share my first impressions of the polish by Miss Ashleigh, sent to me from Ella Ann Cosmetics. The polish comes packaged in a white designer box, with the super cute heart logo in a bold modern style. The box also has a window cut out so the polish color is visible before it's removed from the box. The brush is a round classic style brush and the formula is fantastic. It is very fluid, easy to control, no clumps or dragging and almost opaque in one coat. I used two coats and topcoat to make sure I had good even coverage for the photos. I've worn the polish for two days now and plan to wear it for a few more and so far, I've not had any chips or cracks. The mani still looks freshly applied. 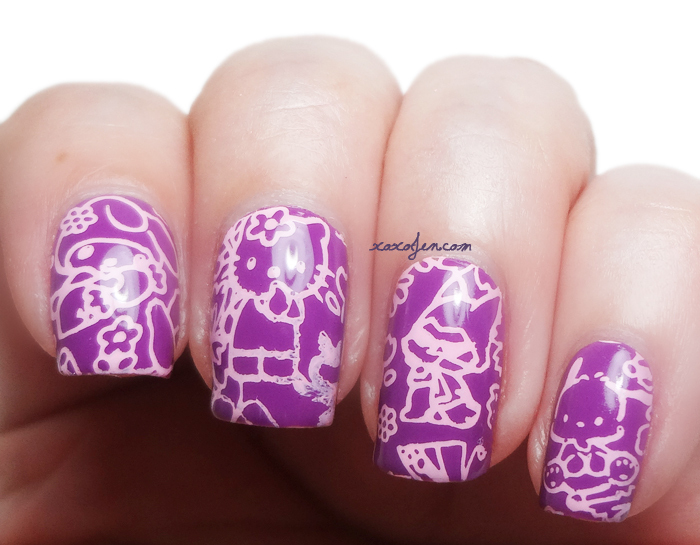 Last night I decided to try out a new Infinity stamping plate that has some of my favorite Sanrio characters on it. I stamped with MDU 25 and a candy head stamper. I hope you'll give the Miss Ashleigh line a try. I think you'll be glad you did! Berry Delicious and many other shades are available at Ella Ann Cosmetics. In fact, many of them are on sale and she's offering a shipping special. Please visit her webpage for more information about those! I am not a purple polish person, usually avoid them. However, I love your mani - that polish on your gorgeous nails, oh, lovely! And I do like a lighter purple, like orchid or with a touch of red in it. Your swatch is just so beautiful! Awesome purple cremes this is! I really like it. I'm glad you like it! The formula was amazing.